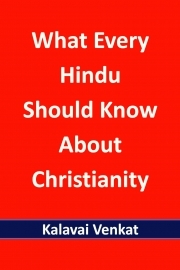 Description of "What Every Hindu Should Know About Christianity"
WHAT EVERY HINDU SHOULD KNOW ABOUT CHRISTIANITY leverages cutting-edge scholarly researches in textual criticism and cognitive sciences to arrive at a reasonable understanding of Christian beliefs. The findings it presents reveal a hitherto unknown face of Christianity to the rational Hindu. It concludes that Christianity originated in a psychotic milieu, Christian beliefs are self-contradictory, and theology invalidates the need to believe. It explores the provocative question of whether Jesus is a myth. It systematically argues that Christianity lacks an ethical framework, 'Herem warfare' is the Christian code of holy extermination, Christian beliefs and practices may cause harm to both Hindus and Christians, and concludes that Hinduism and Christianity cannot coexist. It offers a prescription on and how to engage Christianity and why mutual respect cannot be the precondition for Hindu-Christian engagement. Kalavai Venkat is the pseudonym of Karthik Venkataramani, a native of the ancient temple town of Kalavai in South India. He is educated in physics and management and works in technology consulting. He is a Silicon Valley-based writer, an atheist, and a practising orthodox Hindu. What Every Hindu Should Know About Christianity is Kalavai Venkat's first in a series of books on religions. Despair to bliss-The message of Bhagavad Gita by P.V.S.SURYANARAYANA RAJU. Reviews of "What Every Hindu Should Know About Christianity"